Succulent meatballs in a tomato sauce. Heat the oil in a heavy based saucepan or dutch oven, add the onions (for the sauce), celery and garlic and cook at a low temperature, stirring occasionally, for about 10 mins. Add the oregano, crushed chilli flakes, passata and water and bring to the boil before turning the heat down to simmer gently (while you make the meatballs. ) Season to taste. Roll the mixture into balls approx. 1tbsp inch in size. We made 28 from this mixture. 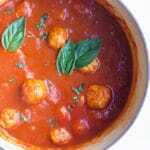 Gently place the balls into the tomato sauce and allow to simmer for 30 mins, until cooked through. I finely chop the vegetables for the sauce but if your kids do not like "bits" in their sauce then I recommend pureeing the onion and celery to give a smoother sauce. You replace the passata with two 400g (14 oz) cans of tomatoes. Freshly grated parmesan works best in this recipe. I buy a block and freshly grate it. You can alternatively buy freshly grated parmesan but don't use the ambient grated parmesan (you find in the pasta aisle), the taste is not the same! For more flavour, you may wish to add some herbs. A little thyme, oregano or basil all works well.